There is just a very stabilizing feeling to know that you’re firmly rooted on the ground because of gravity, but sometimes, design of devices might take a less conventional approach in order to grab your eye (as well as those of your guests). Enter the $69.95 Vertical Turntable from Hammacher – this is the only turntable of its kind at the moment that will mount to a wall, playing your records vertically. Sounds like one of the more modern CD player designs, don’t you think so? This is perfect for those who live in cramped apartments, where it will secure your precious record to its platter thanks to a locking mechanism that delivers smooth, uninterrupted play. 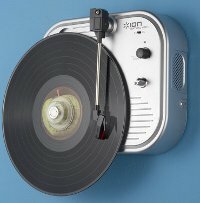 The turntable relies on a two-speed belt drive to spin 33 1/3- or 45-speed LPs, where it will have a ruby-tipped stylus that picks up the nuances of vinyl recordings. A couple of integrated 5-watt speakers with volume control delivers crystal clear audio, and once you’re record is done, the turntable will stop automatically. It runs on a quartet of AA batteries, so we would suggest getting rechargeables if you want to keep this for the long run. While that might mean more hassle than a direct connection to a power outlet, at least it is far more portable without being confined to the length of a wire.